Mermaids on the whole are a very friendly race that is most curious about the people and creatures that live on land and in the air. 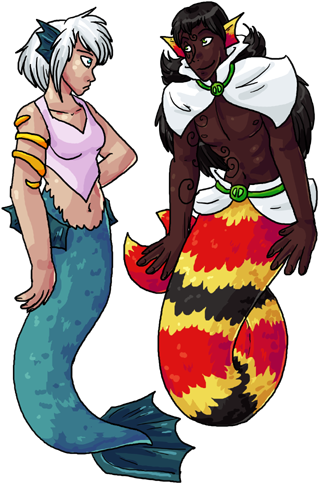 Though they mostly live in the open seas, occassionally mermaids will take up residence in a freshwater lake or river, often to the surprise of the nearby land-dwellers. It's said that some mermaids have the ability to change their form to walk on land, but not for very long. They can breathe both above and underwater. The patron god of the merfolk is Ceriri, the Goddess of Wishes. The average lifespan of a merfolk is 120-150 years. Mermaids and the other peoples did not know each other existed for many centuries, due to the fact that neither could really travel where the other lived. The first discovery of the dry world by the mermaids was when Leviathan the God of Water granted several 'taur heroes passage through his kingdom, the sea, so that they might recover a magical artefact that had been lost in a shipwreck. When the 'taurs and the mermaids saw each other, it was hard to tell who was more surprised. Since then, it's not undeard of for people to use magic to travel between the sea and the land. Most people who cross the seas by ship do so guided by mermaids. "Mermaid" can refer to both male and females. Merfolk can also be used, but is far less common.